Club de Golf Alcanada is laying the foundations for a successful 2019 as their green renovation project gathers pace. 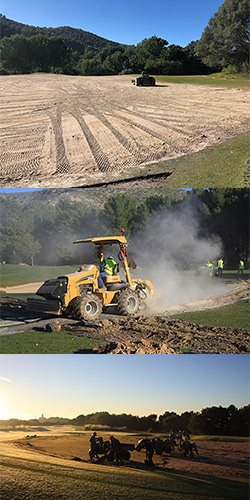 The ambitious renovation project is part of a €600,000 investment to further improve what is already considered by many to be Mallorca’s premier golf course. The diggers and experts moved in at the start of December to relay all 18 greens with new bentgrass T1, a superior variety of seed used at famous clubs such as Valderrama and Golf National, in Paris, which hosted last year’s Ryder Cup. Anticipation is now growing at the prospect of playing some of the finest new greens in Europe, which will see the Robert Trent Jones Jr-designed course scale new heights when it reopens in March. With the progress on schedule, the project is approaching the midway point. New irrigation and re-shaping has already been completed on some of the greens and the first batch of fresh turf – which has been grown and nurtured in Arévalo near Madrid – will arrive at Alcanada this week. Director of golf at Club de Golf Alcanada, Kristoff Both said: “A lot of great work has been going on since the start of December and it is really taking shape now. High-resolution images of Club de Golf Alcanada may be downloaded for editorial purposes from here.